At the heart of any authentic religious tradition is devotion, adoration and love; and this should not be a surprise because the world came into existence for the very truth that God (the Divine Consciousness) in the pre-eternity was a Hidden Treasure and It longed to be known and loved, hence the creation was made to manifest. That longing to be known and to be loved permeates the creation. The cosmogenesis and unfolding of creation is love, the play of sustaining-the-creation is love and the destruction and folding back is also to draw near the lovers. Love and love alone is the invisible force through which all is sustained by the Beloved. Now if we understand the above, then next question is where does this love manifest the most intensely upon this plane of existence? It manifested the best at and through a fully awakened human being. The Divine Messengers across ages each were such love awakened human beings and in the personality of Muhammad the culmination reached its zenith and in whom all qualities of all previous Messengers came in full circle. The reality of the locus of Divine Love's manifestation within haqiqat e Muhammadiyya or reality of Muhammadan light is a reality beyond history and time, yet the historical appearance and disappearance of the historical personality of Muhammad had to manifest within a particular time. O Allah, grant blessings and peace upon our Master Muhammad, the opening of what had been closed, and the Seal of what had gone before, and the helper of the Truth by the Truth, and the guide to Your Straight Path, Allah's blessings be upon him and upon his Family and his Companions; equal to his immense position and grandeur. So the Divine Prescription is to follow a fully awakened human being and among that rank, the Seal of the Divine Informers, the Last of Prophet Muhammad Mustafa is the first to be created and last to be sent. He is the model per excellence and most contemporary as well as most well documented model in history which is so that people may find guidance in following his footstep. So following him is made into a pre-requisite to receive Divine Forgiveness for our falling short of perfection which is our soul's natural state of being as well as to attract Divine Love. ... follow me (the Divine Messenger and Divine Informer and Guide), Allah will love you (yuhibqumuLlah). As illustrated above, the journey towards attaining Divine Love begins by the recognition and knowledge of the fully awakened human being, in this case, the Seal of the Prophets. If we fail to recognize him in 2014 AD, we are no different than those who failed to recognize him during his lifetime during circa 610 AD. Such fully awakened human beings are such that can not help but to fall in love with them. They having the highest mandate of love (habibAllah), all souls who come in contact with them, even remotely, beyond time, enters into the fellowship of love. When one love something or someone, it becomes almost automatic to follow that object or person. Rule of love is such. A lover start to love everything about his, her beloved and following the ways are a by product of genuine love. 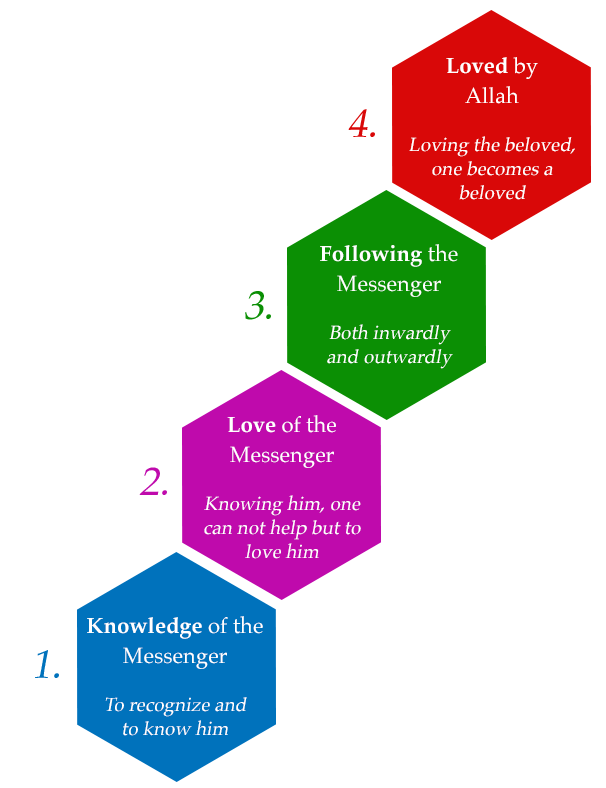 Thus following the way of the Messenger (Sunnah) is a link in this hierarchy of love. And when someone follow the Way of the one who is a beloved (habib) of Allah, one also become a beloved. This is the highest attainment. What else a lover of God can ask for except the love of Allah. On this month of Rabiul Awwal, in remembrance of the beloved guide and divine messenger, Muhammad Rasulallah, following are a roundup of past posts on Technology of the Heart on knowing, recognizing and means of loving the habib, sallallahu alayhi wa sallam. Clicking on each graphics below will take to the original article. May they help us awaken love for our Beloved Master, seal of Prophets and the mercy to all beings. How Did Prophet Muhammad Look? The journey towards attaining Divine Love begins by the recognition and knowledge of the fully awakened human being. A roundup post on the occasion of Rabiul Awwal.